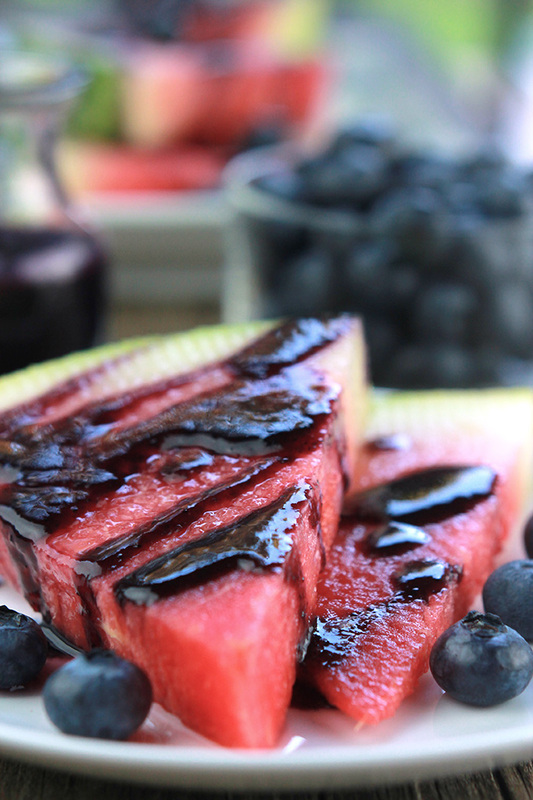 Summer may be over but there’s still summer fruit to enjoy. 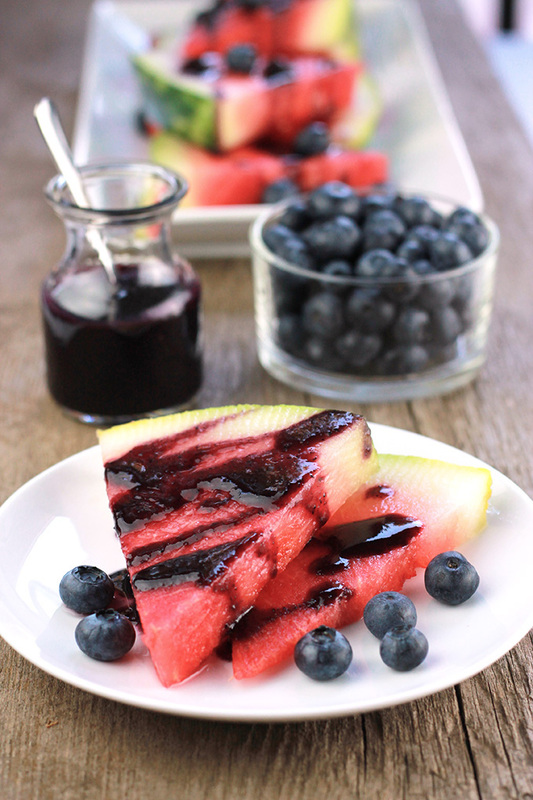 This Blueberry Glazed Watermelon is a perfect way to enjoy the last fruits of summer. I walked into the grocery last week and up front and center was a big box of watermelons. Yes, it’s officially fall but still warm here in Texas, and I am enjoying the final fruits of summer. Growing up we would eat cool crisp watermelon with a little sprinkling of salt. 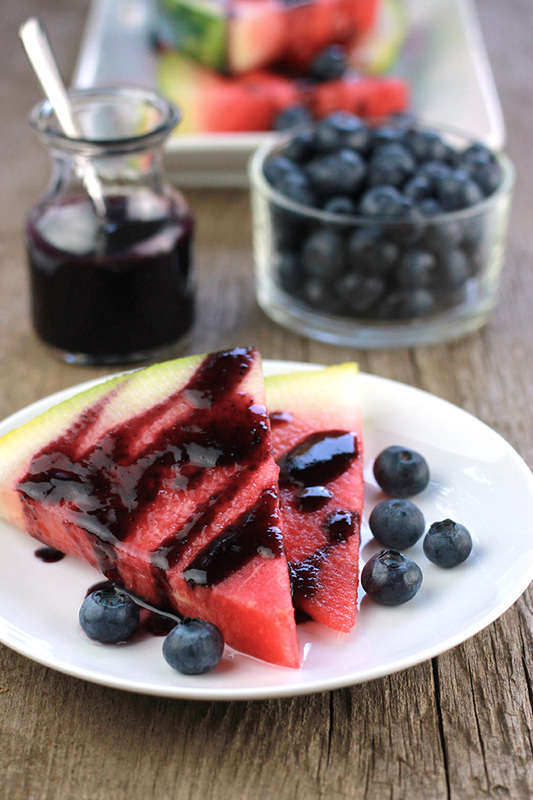 I’ve decided to forgo the salt and drizzle my watermelon slices with a sweet, smooth blueberry glaze instead. I had made the glaze earlier in the week to use over ice cream and decided to give it a try over the watermelon. So delicious! 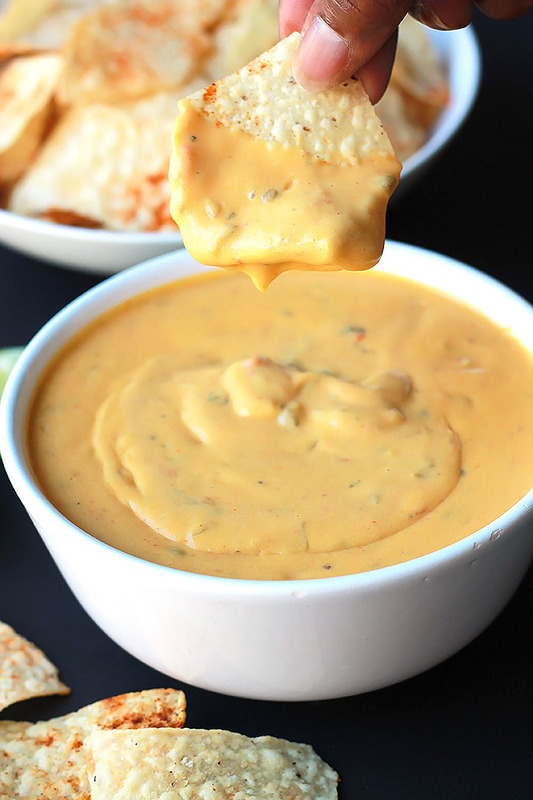 How could you pass on a snack like this? Not only is it delicious, it’s healthy. The blueberries are loaded with fiber, potassium, vitamin C, B6 and it helps lower cholesterol. 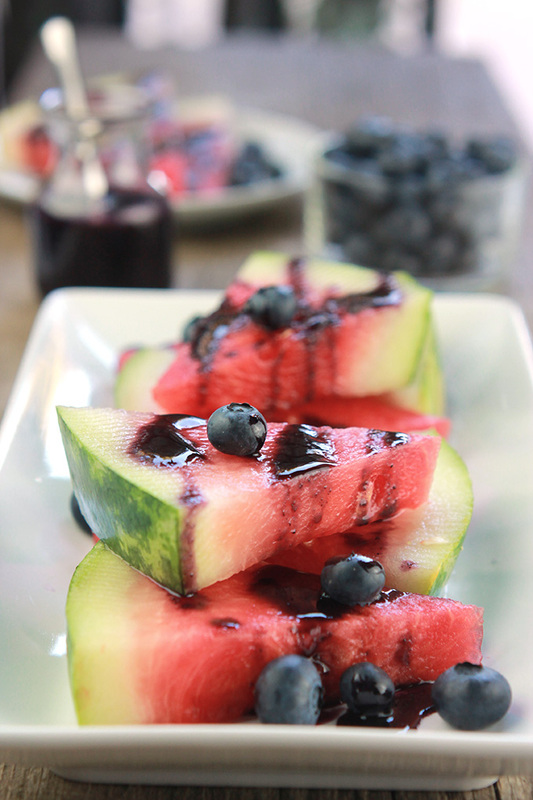 Watermelon is mostly water but it’s filled with vitamin A, B6, C lycopene, antioxidants and amino acids. It’s nice when healthy and delicious come together. Fall and winter is my favorite time of the year, and I’m looking forward to the cooler weather but I’m going to enjoy the sweet fruits of summer until they’re all gone. If you make this recipe or a version of it, take a picture and share with me on Instagram, tag it #thewholeserving or leave a comment below. 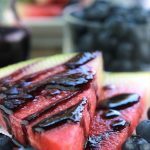 I’d love to see or hear about your version of this Blueberry Glazed Watermelon. Wow this looks so tasty and healthy. 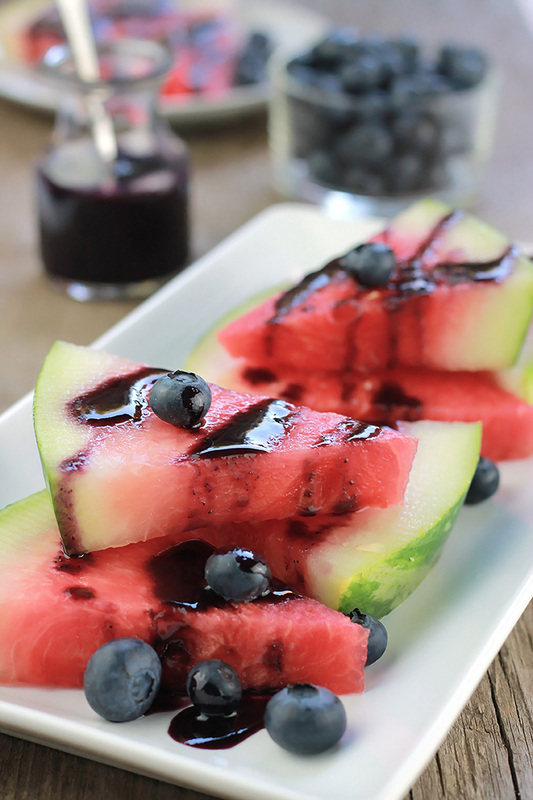 What a wonderful combination of flavors – watermelon and blueberries. 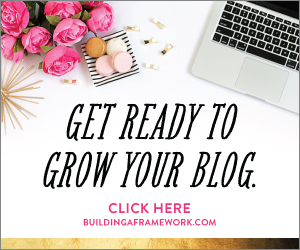 We would be glad to have you come and link up at Real Food Fridays that goes live every Thursday @7pm EST. Sharing! Wow, Celeste, this is perfect. Watermelons are always on our Christmas menu, it’s kind of a tradition in South Africa and this is definitely going to be a winner this year. Wow! I would love to be a guest at your Christmas celebrations. I won’t be able to have watermelon at Christmas, non to be found here. You’re welcome Suzie, It is so delicious and hopefully you can try before all the watermelons are gone. Oh Celeste, this looks so good. My mouth is watering, no pun intended, lol watermelon. Ha! I’m a Geek! What a great flavor combination this is. And a fun way to get in more than one serving of fruit. This is definitely a treat going into the fall, I’m not ready to let go of summer yet! You’re so funny Nikki, I went looking for some watermelons today so I could have some of this deliciousness. Oh.my.goodness! I’ve always just eaten watermelon as is and have been too naive to do much else with it! Thank you for the idea and for sharing this at Funtastic Friday! Angie I was the same but after making this I can’t get enough. It’s so delicious. Enjoy! It’s so delicious and you will enjoy! You made a great combination. Watermelon is perfect choice for summer day!!!!! This is so delicious and love it throughout the summer.